Coutee's top goal heading into the coming campaign is to play the Texans' full slate of games, Aaron Reiss of The Athletic reports. Coutee (hamstring) caught 11 of 14 targets for 110 yards and a touchdown during Saturday's 21-7 loss to the Colts. Coutee (hamstring) is listed as active Saturday against the Colts. Analysis: The expectation of active status for Coutee has come to pass, per Aaron Wilson of the Houston Chronicle and Adam Schefter of ESPN. Coutee thus will be making his first appearance since Week 12 and just his third overall since Week 7. In addition to working behind target hog DeAndre Hopkins, Coutee may be hard-pressed to produce against a Colts defense that allowed just three wide receiving corps to surpass 100 yards through the air over the final eight games of the regular season. Coutee (hamstring) is expected to be active for Saturday's wild-card matchup with the Colts, Adam Schefter of ESPN reports. Coutee (hamstring), who is listed as questionable for Saturday's wild-card matchup with the Colts, is expected to play, Aaron Wilson of the Houston Chronicle reports. Analysis: Coutee has participated fully in each of the three practice sessions this week, so it's a bit surprising that his status is still considered up in the air for the contest. Given his participation level and the gravity of the game, there are multiple reasons to believe he will give it a go. Still, we likely will have to wait until game-day inactives surface to learn his fate. Coutee (hamstring) was a full participant in Wednesday's practice, Aaron Wilson of the Houston Chronicle reports. Analysis: Listed as a full participant on consecutive days, Coutee appears ready to return from his five-game absence for Saturday's playoff matchup with the Colts. He roasted the Indianapolis secondary for 11 receptions in his NFL debut back in Week 4, but he's otherwise been limited by hamstring injuries throughout his rookie season. Coutee should get most of his work in the slot, pushing DeAndre Carter either outside or to the bench. Coutee (hamstring) was listed as a full practice participant Tuesday, Aaron Wilson of the Houston Chronicle reports. Analysis: Coutee hasn't logged many full practice sessions this season and hasn't played in a game since Week 12. The upgrade suggests he's on track to return for Saturday's playoff game against the Colts, potentially facing a defense that he caught 11 passes against in his NFL debut back in Week 4. Coutee's return would likely result in a reduced role for DeAndre Carter, who caught 19 of 22 targets for 182 yards the last five weeks. Coach Bill O'Brien believes Coutee (hamstring) has a shot to play in Saturday's playoff game against Indianapolis, Aaron Wilson of the Houston Chronicle reports. "Definitely, I think he's trending that way," O'Brien said. "I think there's a shot. We have to see how he looks in practice on a day-to-day basis, but there's a shot there." Coutee (hamstring) is inactive for Sunday's game against the Jaguars. Analysis: With Coutee -- who hasn't played since Nov. 26 -- still out, DeAndre Carter figures to continue to see added work out of the slot in Houston's Week 17 offense. Coutee (hamstring) is listed as questionable for Sunday's game versus the Jaguars. Analysis: Coutee's practice reps have been impacted for much of his rookie season by a lingering hamstring issue, and this week was no different, when he was limited on each of Houston's injury reports. With a questionable tag, he at least enters the weekend with a chance to play, but the Texans may opt to hold him out for a fifth consecutive contest with an eye toward the postseason. In that case, DeAndre Carter would benefit out of the slot. The Texans listed Coutee (hamstring) as a limited participant in Thursday's practice. Analysis: The activity level represents no change from Wednesday and essentially the entire season, as Coutee has missed games on three different occasions as a result of hamstring issues. Unless he puts in a full practice Friday, there may not be a clear indication of what direction Coutee's status is trending in for Sunday's game against the Jaguars. DeAndre Carter would operate as the Texans' primary slot man if Coutee's latest hamstring setback ultimately forces a fifth consecutive absence. Coutee (hamstring) was a limited participant at Wednesday's practice. Coutee (hamstring) is out heading into Sunday's contest against the Eagles. Analysis: Both Coutee and running back Lamar Miller have been downgraded from their respective Friday questionable statuses, thus limiting the Houston offense heading into a pivotal matchup. In the case of Coutee, who will miss his fourth consecutive game, DeAndre Carter will once again take over as the slot wide receiver. In the last three weeks, Carter has been targeted 10 times, and that figure could be even higher if not for a Week 14 concussion which he sustained early in the first half. Coutee is expected to be out until he is fully healed from his third hamstring injury of the season, Aaron Wilson of the Houston Chronicle reports. Analysis: Coutee has missed a total of eight games over three separate stints while dealing with a hamstring injury that he's been unable to shake. He's questionable heading into Sunday's game, which implies he's not fully recovered. So, that means we could see DeAndre Carter fill in as the starting slot receiver against the Eagles in Week 16. Coutee (hamstring) is listed as questionable for Sunday's game against the Eagles after practicing in a limited fashion all week. Analysis: Coutee last played Nov. 26 and hasn't practiced fully since that time, making his status a tough one to predict heading into Sunday's 1 p.m. EST kickoff. Even if Coutee is cleared to play when the Texans release their inactive list 90 minutes prior to game time, it's unclear how heavily he would be utilized. DeAndre Carter is a candidate to garner snaps out of the slot if Coutee sits out again or is limited. Coutee (hamstring) was limited at practice Wednesday. Analysis: Coutee, who last suited up Nov. 26, was also limited at practice last week before sitting out Saturday's game against the Jets. The 2018 fourth-round pick is therefore not a lock to suit up this weekend against the Eagles. If Coutee is out or limited this weekend, added opportunities would once again be on tap for DeAndre Carter. Coach Bill O'Brien called Coutee (hamstring) "day-to-day" Monday, Deepi Sidhu of the Texans' official site reports. Analysis: O'Brien and his players pay a visit to Philadelphia on Sunday to take on the suddenly relevant Eagles, a contest for which injured Texans will be considered game-time decisions. Coutee has suited up just twice in seven attempts since Week 7, so O'Brien should be taken at his word regarding the rookie wide receiver, barring his designation getting removed entirely during Week 16 prep. Coutee (hamstring) will not play Saturday against the Jets. Analysis: Coutee was listed as questionable on the Texans' final injury report of the week, but he did not travel to New York with the rest of his teammates, which removes any chance of him playing Week 15. While fantasy players will not have Coutee available this week, they will be afforded more time to identify a replacement. Coutee (hamstring) is listed as questionable for Saturday's game against the Jets. Analysis: Coach Bill O'Brien suggested Tuesday that Coutee is day to day and "trending toward being able to play" as Saturday's game against the Jets approaches. Final word will come on Coutee's status when the Texans release their last injury report of Week 15 on Thursday, but unless he advances to full participation in practice, it seems likely that he'll carry a questionable designation into the weekend. Coutee (hamstring) was a limited participant at Tuesday's walkthrough. Coach Bill O'Brien relayed Tuesday that Coutee (hamstring) remains day-to-day but is "trending toward being able to play" this weekend against the Jets, Aaron Wilson of the Houston Chronicle reports. Coutee (hamstring) is inactive for Sunday's game against the Colts. Analysis: With Coutee out Sunday, DeAndre Hopkins and Demaryius Thomas are on track to head the Texans' Week 14 wideout corps, with DeAndre Carter in line to chip in from the slot after snagging all six of his targets for 32 yards in last Sunday's win over the Browns. Coutee (hamstring), who is listed as questionable for Sunday's game against the Colts, isn't expected to be active for the contest, Ian Rapoport of NFL Network reports. Coutee (hamstring) is listed as questionable for Sunday's game against the Colts, Aaron Wilson of the Houston Chronicle reports. Analysis: This is a mere formality after coach Bill O'Brien said earlier Friday that Coutee's status for Week 14 will once again come down to a game-time decision. The rookie slot man was held out of last week's 29-13 win over the Browns, allowing DeAndre Carter to catch six passes for 32 yards while filling in as the No. 3 receiver. Coutee's status may not be clear until the Colts release their inactive list approximately 90 minutes before Sunday's 1 p.m. EST kickoff. Coach Bill O'Brien said Friday that Coutee (hamstring) is "trending upwards," but noted the wideout's status for Sunday's tilt with the Colts won't be decided until gameday, Drew Dougherty of the Texans' official site reports. Analysis: Coutee was in the same position last week and ultimately was ruled inactive, so there could be some risk in planning to include him in fantasy lineups ahead of the 1 PM ET kickoff. His official injury designation for Week 14 will be revealed at some point after Friday's practice. Coutee (hamstring) was a limited participant in Thursday's practice. Analysis: Unless Coutee logs every rep of Friday's practice, it seems likely that he'll carry a questionable designation into the weekend for the second straight contest. Coach Bill O'Brien labeled the rookie a game-time call in Week 13 before Coutee was ultimately inactive for the Texans' 29-13 win over the Browns. It wouldn't be surprising if O'Brien labeled Coutee the same way again ahead of Sunday's tilt with the Colts, which would make the wideout a risky option in Week 14 fantasy lineups. Coutee (hamstring) was a limited participant during Wednesday's practice. Coutee (hamstring) is inactive for Sunday's game against the Browns. Analysis: After aggravating the hamstring injury in Monday's 34-17 win over the Titans, Coutee wasn't able to advance beyond limited practice participation this week, prompting Houston to hold him out for the sixth time this season. 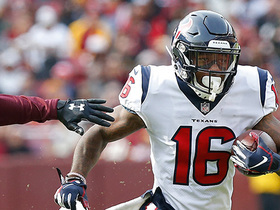 With Coutee in street clothes, DeAndre Carter could benefit from more opportunities to play alongside DeAndre Hopkins and Demaryius Thomas in three-receiver formations. Coach Bill O'Brien relayed Friday that Coutee (hamstring) will be a game-time decision for Sunday's game against the Browns, Aaron Wilson of the Houston Chronicle reports. Analysis: Fortunately for those considering Coutee in Week 13 fantasy lineups, the Texans kick off at 1 p.m. EST. That said, with Coutee's hamstring an issue again, he wouldn't be the safest lineup play this weekend if he is cleared to go, especially with Demaryius Thomas easing into a bigger role in the Houston offense behind top wideout DeAndre Hopkins (foot). Coutee (hamstring) was a limited participant at Thursday's practice. Analysis: During Monday's 34-17 win over the Titans, Coutee aggravated the hamstring injury that has already cost him five games this season. Though the recurring nature of the injury is somewhat troubling, coach Bill O'Brien expressed optimism the wideout would be good to go for the team's Week 13 tilt with the Browns. Coutee's involvement for the first two days of practice is an encouraging sign, but he seems likely to carry a designation into the weekend if he fails to log a full session Friday. Coutee (hamstring) was listed as a limited practice participant Wednesday, Aaron Wilson of the Houston Chronicle reports. Coach Bill O'Brien said Coutee (hamstring) is considered day-to-day and is "trending toward being able to play" Week 13 against the Browns, Deepi Sidhu of the Texans' official site reports. Analysis: Coutee was unable to rejoin Monday's win over Tennessee after exiting with a hamstring injury, leaving his status in flux moving forward. O'Brien's comment provides a reason for optimism, but Coutee's participation level in practice throughout the week will likely provide a better indication of his availability for Week 13. The rookie slot receiver has dealt with hamstring issues since the start of training camp, missing Weeks 1-3 and 8-9. Coutee is questionable to return to Monday's game against the Titans due to a hamstring injury. Analysis: Coutee has already missed five games this season due to hamstring injuries and appears to have aggravated the issue yet again. Before exiting the game, the rookie recorded two receptions for 14 yards. His status will now bear monitoring heading into the Texans' Week 13 contest against the Browns. Coutee (hamstring) won't carry an injury designation into Monday's game against Tennessee. Analysis: Coutee began the week with a pair of limited practices, but faced no limitations Saturday to avoid the questionable tag. The 21-year-old saw a slightly smaller snap share than newcomer Demaryius Thomas last week, but massively outproduced him with five catches for 77 yards while Thomas failed to catch his lone target. Coutee (hamstring) remained limited at practice Friday. Analysis: The same applies to fellow receiver DeAndre Hopkins (foot), though we'd expect both players to suit up Monday night against the Titans. Hopkins figures to approach the contest minus an injury designation, while there's still a chance that Coutee could be listed as questionable on the Texans' final Week 12 injury report. Coutee (hamstring) was listed as a limited practice participant Thursday. Analysis: The same applies to fellow receiver DeAndre Hopkins (foot), though we suspect that the listed limitations of both players Thursday were maintenance-related. In his return to action in Week 11's win over Washington, Coutee was on the field for 42 of a possible 63 snaps on offense, en route to hauling in five of his nine targets for 77 yards. 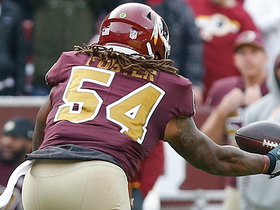 Coutee (hamstring) caught five of nine targets for 77 yards in Sunday's 23-21 win over the Redskins. Analysis: Coutee led Houston in targets and receiving yards while tying DeAndre Hopkins with a team-high five receptions. Hopkins scored his sixth touchdown in the past five games, so there's no question about the alpha dog in this passing game. Still, Coutee looks to have an edge over Demaryius Thomas for Houston's No. 2 wide receiver role ahead of a Week 12 meeting with the Titans. Coutee (hamstring) is active for Sunday's game against the Redskins. Coutee (hamstring) is listed as questionable for Sunday's game against the Redskins but is expected to play, Adam Schefter of ESPN reports. Coutee (hamstring) is officially listed as questionable for Sunday's game against Washington after practicing in a limited fashion all week. Analysis: Per Sarah Barshop of ESPN.com, coach Bill O'Brien said that Coutee "has a chance" to play Sunday, so the rookie fourth-round pick should be viewed as a game-time decision leading up to the 1 p.m. EST kickoff. If Coutee is limited or out this weekend, Demaryius Thomas would be in line for added work while playing alongside Houston's undisputed top pass catcher, DeAndre Hopkins. Coach Bill O'Brien said Friday that Coutee (hamstring) will be a game-time decision for Sunday's contest against the Redskins, but he thinks the wideout "has a chance to play," Aaron Wilson of the Houston Chronicle reports. Analysis: Coutee hasn't taken the field since Week 7, but it appears he's progressed enough on some level coming off the Texans' Week 10 bye to have a realistic shot at playing Sunday. 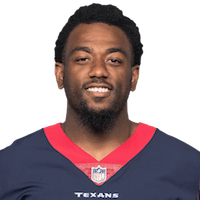 Unless he's officially ruled out -- which would be a surprise -- when the Texans' final injury report of the week comes out later Friday, it appears Coutee's availability for Week 11 won't be known until the Texans release their gameday inactives approximately 90 minutes prior to Sunday's 1 p.m. EST kickoff. Analysis: Earlier this week, Deepi Sidhu of the Texans' official website reported coach Bill O'Brien said Coutee was "trending upwards" in his recovery. If the rookie pass-catcher is able to return to action Sunday against Washington, he'll face competition for targets behind top wideout DeAndre Hopkins from newcomer Demaryius Thomas, who is in line to play his second game for Houston. Coutee (hamstring) said he expects to return for Sunday's game at Washington, Deepi Sidhu of the Texans' official website reports. Coach Bill O'Brien said there's a "strong possibility" Coutee (hamstring) returns to action Sunday in Washington, Drew Dougherty of the Texans' official site reports. Analysis: Coutee has been plagued by a left hamstring injury since early August, but when healthy he posted a pair of impactful outings (11-109-0 in Week 4 at Indianapolis and 6-51-1 in Week 5 against the Cowboys). Seeking his first appearance since Week 7, he would have to contend with newcomer Demaryius Thomas for looks behind target monster DeAndre Hopkins. Coutee (hamstring) said he won't return until he is 100 percent healthy, Aaron Wilson of the Houston Chronicle reports. Coutee (hamstring) was downgraded from questionable to out for Sunday's game against the Broncos. Coutee (hamstring) is listed as questionable for Sunday's game against the Broncos. Coach Bill O'Brien said Friday that the Texans will work Coutee (hamstring) out on Saturday to determine his availability for Sunday's matchup with the Broncos, Aaron Wilson of the Houston Chronicle reports. Analysis: Coutee was able to get some work in at the Texans' first two practice sessions of the week, so it's likely he'll do the same Friday. Regardless how much he does Friday, though, it appears the Texans will wait another day to make a call on his Week 9 availability. Their decision may not be announced until the team releases its inactive list approximately 90 minutes prior to the 4:05 p.m. EST kickoff. Coutee (hamstring) was limited at Wednesday's practice. Coach Bill O'Brien acknowledged Monday that it's too early to tell if Coutee (hamstring) will return for Sunday's game in Denver, Sarah Barshop of ESPN.com reports. With Will Fuller out for the season with a torn ACL, once Coutee is back from the strained hamstring that led to him missing Thursday's win over the Dolphins, the rookie pass catcher is in line for added work in tandem with top wideout DeAndre Hopkins, Aaron Wilson of the Houston Chronicle reports. Coutee (hamstring) was ruled out for Thursday's game against the Dolphins. Coutee (hamstring) was listed as a limited participant at Tuesday's walkthrough. Analysis: Coutee was limited at Monday's walkthrough as well, so there is little to glean from the first two practices of the week. The 21-year-old's hamstring injury isn't viewed as a long-term issue, but he indicated after Sunday's game he is unlikely to be available for Thursday's matchup with the Dolphins. Coutee's status for Thursday is unlikely to change barring a significant improvement at Wednesday's practice. Coutee (hamstring) was listed as limited on Monday's injury report, the Texans' official site reports. Coutee (hamstring) said that he'll likely be unavailable for Thursday's game against the Dolphins, but his injury isn't considered especially serious and the Texans aren't fearing a long-term absence, Ian Rapoport of NFL Network reports. Though Coutee said the hamstring injury he suffered in Sunday's win over the Jaguars isn't as bad as the one that slowed him earlier this season, he doesn't expect to play Thursday against the Dolphins, Aaron Wilson of the Houston Chronicle reports. Analysis: The short turnaround makes it very difficult for Coutee to rebound in time for Thursday night's contest. His anticipated absence figures to free up some targets for fellow wideouts DeAndre Hopkins and Will Fuller. Coutee is questionable to return to Sunday's game against the Jaguars with a hamstring injury. Analysis: Coutee has been struggling with hamstring issues all season, so he may have aggravated the injury. The Texans only have three healthy wideouts without their rookie fourth-round pick, so Sammie Coates figures to see an uptick in snaps for the time being. Coutee (hamstring) doesn't carry an injury designation into Sunday's game against the Jaguars. Analysis: The Texans continue to list Coutee on the injury report despite no hint that he has suffered a setback since making his NFL debut Week 4. He'll face a tough Jacksonville defense this Sunday, though the matchup could direct targets away from DeAndre Hopkins (foot) and Will Fuller (hip), which would seem to work in the slot receiver's favor. Coutee caught three of five targets for 33 yards in Sunday's 20-13 win over Buffalo. Analysis: Coutee's five targets were second only to DeAndre Hopkins (six), as Houston's vaunted passing game wasn't very crisp Sunday. That can be attributed to the health of quarterback Deshaun Watson (chest), who attempted just 25 throws. Coutee, who entered the game with 22 catches over the last two games, might experience similar usage Week 7 if Watson's health remains the same, particularly against the imposing pass defense of the Jaguars. Coutee (hamstring) does not carry a Week 6 injury designation after practicing in a limited fashion all week. Analysis: The same goes for DeAndre Hopkins (foot) and Will Fuller (hamstring), meaning that the Texans will have their top three pass catchers available Sunday against the Bills. Meanwhile, Deshaun Watson (chest) is listed as questionable for the contest, but we'd be surprised if he didn't play. Coutee, who made his NFL debut Week 4, is already on the PPR radar, after having logged 17 catches on 22 targets for 160 yards and a touchdown in that span. Coutee (hamstring) was a limited participant in Sunday's game against the Bills. Analysis: Along with Coutee, fellow starting wideouts Will Fuller (hamstring) and DeAndre Hopkins (foot) were also limited, but there's been no indication from the Houston coaching staff that any of the three is in danger of missing Sunday's game against the Bills. 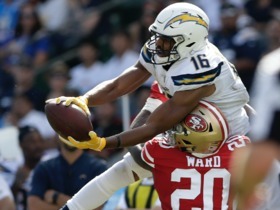 After the hamstring issue kept him inactive for the first three weeks of the season, Coutee has opened his NFL career on a productive note the last two games, totaling 17 receptions on 22 targets for 160 yards and a touchdown. Coutee (hamstring) was listed as a limited participant at Wednesday's practice. Analysis: DeAndre Hopkins (foot) and Will Fuller (hamstring) were limited as well, but it's expected all three wideouts will be ready to go Sunday against the Bills. 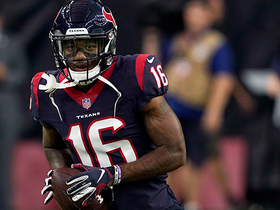 The Texans ran plenty of three-receiver sets in the Week 5 win over the Cowboys, with Coutee turning his 57 offensive snaps (out of a possible 80) into six catches on seven targets for 51 yards and a touchdown. Coutee caught six of seven passes for 51 yards and a touchdown in Sunday's 19-16 overtime win over Dallas. He also ran one time for two yards. Coutee (hamstring) is listed as active for Sunday night's game against the Cowboys. 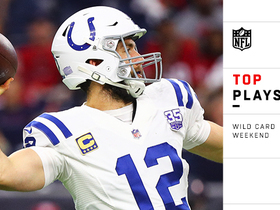 Analysis: Coutee burst onto the scene in his NFL debut Week 4, logging 11 catches (on 15 targets) for 109 yards in the Texans' 37-34 overtime win over the Colts. The continued presence of wideouts DeAndre Hopkins and Will Fuller (hamstring) will make duplicating those numbers in the coming weeks quite a challenge for Coutee, more so Sunday night, with Ian Rapoport of NFL Network having previously indicated that if the young slot man did play Week 5, he'd have to play in pain. Coutee (hamstring) is expected to play against Dallas on Sunday, but the Texans want to test him pre-game before announcing his availability, Adam Schefter of ESPN reports. The Texans and Cowboys kick off at 8:20 p.m. EDT. Analysis: Both Coutee and Will Fuller (hamstring) will be tested during pre-game warmups to determine their availability against the Cowboys. If either of the two is unable to go, Sammie Coates will move up the depth chart; if both are out, Vyncint Smith will join Coates on the active roster. Coutee (hamstring) is listed as questionable for Sunday's game against the Cowboys. Coutee (hamstring) was listed as a limited participant during Thursday's practice. Coutee caught 11 of 15 targets for 109 yards during Sunday's 37-34 win over the Colts. Analysis: What do you make out of a rookie receiver leading his team in targets and catches in his debut? It's almost impossible to tell, and Sunday's matchup against a quality Dallas defense will shed some light, but you couldn't ask much more from Coutee on Sunday. There's a lot of competition in Houston with the likes of DeAndre Hopkins and Will Fuller, but Coutee seems to already have a rapport with Deshaun Watson, who relied on similar smallish, shifty slot targets while starring at Clemson. Coutee (hamstring) doesn't have a designation for Sunday's contest at Indianapolis, Sarah Barshop of ESPN.com reports. Coutee (hamstring) only managed limited practice participation Wednesday, but he suggested he'll be ready to make his NFL debut Sunday in Indianapolis, Aaron Wilson of the Houston Chronicle reports. "I'm back," Coutee said. "I feel confident. With Bruce [Ellington] going down, it's a tragedy to see him go down with the same thing I've had. I'm ready to step up." Analysis: Coutee alluded to Ellington being placed on injured reserve earlier in the week due to a hamstring issue of his own, but it appears the rookie's injury is mostly in the rear-view mirror at this point. The fourth-round pick out of Texas Tech could make a quick push for the No. 3 wide receiver job, despite missing the entire preseason and the first three weeks of the regular season. Coutee will have to compete with Sammie Coates (hamstring) and Vyncint Smith for those duties. Coutee (hamstring) is inactive for Sunday's game against the Giants. Analysis: Coutee was unable to upgrade from limited to full practice at any point this week, so his NFL regular-season debut will have to wait at least one more game. With both Coutee and Sammie Coates (hamstring) inactive Sunday, Vyncint Smith will serve as the Texans' No. 4 wideout. The Texans have listed Coutee (hamstring) as questionable for their Week 3 game versus the Giants. Analysis: No surprise here, as Coutee was a limited participant in practice all week. The rookie has been battling this issue for the first few weeks of the season, and has yet to suit up. If he does end up making his NFL debut it will likely just be in a depth receiver role, as well as special teams assistance. Analysis: Coutee was limited throughout last week and was ultimately unable to suit up in the Texans' 20-17 loss to the Titans. The rookie will likely need to put in a full practice Thursday or Friday to have a solid case for making his NFL debut this weekend against the Giants. The Texans downgraded Coutee (hamstring) to out ahead of Sunday's matchup with the Titans, Aaron Wilson of the Houston Chronicle reports. Analysis: Although Coutee was able to practice in limited fashion throughout the week, he is not healthy enough to give it a go Sunday. Sammie Coates (hamstring) has also been ruled out, so Vyncint Smith could be in line for another increased workload providing depth at receiver. Coutee (hamstring) is questionable to play in Sunday's game against the Titans. Analysis: Coutee practiced in a limited fashion all week and may still be working his way back from a hamstring injury that cost him the entire preseason. With Sammie Coates (hamstring) also uncertain to suit up, Vyncint Smith could again log extensive reps on offense. Coutee (hamstring) was limited in Wednesday's practice. Analysis: Coutee was inactive for the team's season-opening loss to the Patriots due to the injury. The rookie fourth-round pick was limited throughout last week before sitting out, so he'll likely need to practice fully either Thursday or Friday to have a realistic shot at making his regular-season debut Sunday against the Titans. Coutee (hamstring) is inactive for Sunday's game against the Patriots. Analysis: With Will Fuller (hamstring) also out, look for Bruce Ellington, as well as rookie Vyncint Smith and possibly Sammie Coates (hamstring), to see added work Sunday opposite star wideout DeAndre Hopkins. Coutee (hamstring) was limited in practice this week and is listed as questionable for Sunday's game against the Patriots. Analysis: The rookie fourth-round pick secured the No. 5 wide receiver role during preseason and may rotate in as a returner if he can shake the hamstring injury. He has tons of potential, as evidenced by his 93 receptions for 1,429 yards and 10 touchdowns in his final collegiate season at Texas Tech. Analysis: Coutee has been hampered by the hamstring injury for over a month, but the receiver seems to be trending in the right direction as the regular season draws closer. If he can put in a full practice Thursday or Friday, he'll have a solid chance at making his NFL debut Sunday against the Patriots. Coutee (hamstring) was held out of Thursday's preseason finale against Dallas, Aaron Wilson of the Houston Chronicle reports. Analysis: Coutee returned to practice last week and said he would make his first NFL appearance Thursday, but the Texans opted for a more cautious approach in holding the rookie fourth-round pick out of action. Coutee's extended absence has prevented him from competing with Bruce Ellington and Braxton Miller for the No. 3 receiver job, likely leaving the rookie fourth-round pick near the bottom of the Week 1 depth chart. Coutee (hamstring) said he would play Thursday in the Texans' exhibition finale against the Cowboys, Drew Dougherty of the team's official site reports. Coutee, who missed nearly three weeks with a hamstring injury, will be a game-time decision for Thursday's preseason finale against the Cowboys. Analysis: "We're just trying to make sure he's ready to go. You never want to put a guy into a National Football League game that might not be full speed," said coach Bill O'Brien. "We'll probably make that decision before the game." Coutee returned to practice last week, and we presumed the 2018 fourth-rounder would play Saturday against the Rams, but that never happened. Apparently, Coutee is not quite over the hamstring injury. Coutee dressed for Saturday's preseason game, but did not play in Houston's 21-20 loss to the Rams. Coutee (hamstring) returned to practice Wednesday, Sarah Barshop of ESPN.com reports. Coutee has a strained hamstring and will be out for a few weeks, Aaron Wilson of the Houston Chronicle reports. Analysis: While the injury doesn't sound too serious, it could still be a significant setback for Coutee, who is expected to compete for the No. 3 receiver job with Bruce Ellington and Braxton Miller. The rookie fourth-round pick now figures to miss a sizable portion of training camp and at least one or two preseason games. Texans receivers coach John Perry said Coutee's biggest challenge is identifying defensive coverage assignments, Mark Lane of USA Today reports. "I keep telling Keke that if he is able to recognize the coverage, there's going to be a lot of people that have a hard time covering him," Perry said. "The reason for that is you need to know who's guarding you. If you don't know that, then you can't beat him." 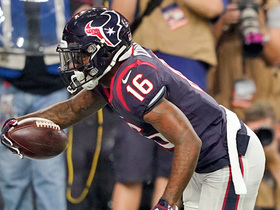 Houston Texans wide receiver Keke Coutee gains 40 yards on catch and run. Houston Texans quarterback Deshaun Watson is picked off on tipped pass, Washington Redskins recover. The "NFL Fantasy Live" crew break down several players across the league to pick up on the waiver wire in fantasy football. 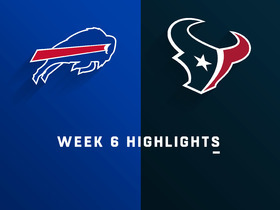 Watch as the Buffalo Bills take on the Houston Texans in Week 6. 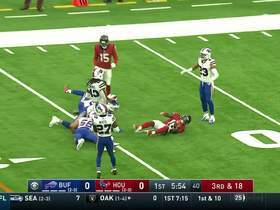 Houston Texans quarterback Deshaun Watson finds a window to wide receiver Keke Coutee for a 22-yard gain and first down. 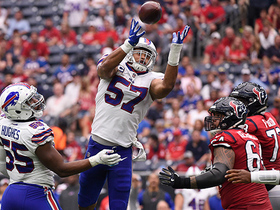 Buffalo Bills linebacker Lorenzo Alexander tips and picks off the ball from Houston quarterback Deshaun Watson for his second career interception. 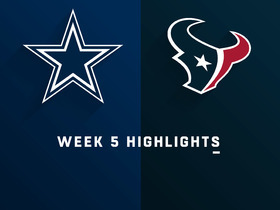 Watch the highlights from the Dallas Cowboys facing off against the Houston Texans in Week 5 of the 2018 NFL season. Houston Texans wide receiver Keke Coutee bounces outside for the Texans' first touchdown of the game on an 1-yard pass from quarterback Deshaun Watson. Which NFL receivers gave fans the wow factor in Week 4? Here's a look at the best catches from around the league.